New Zealand needs just four more race wins to take the America’s Cup from Team USA. Team New Zealand now has a 3-0 lead over the Oracle team. Team New Zealand with Peter Burling as the helmsman is threatening team USA to sail away with the trophy. The America’s Cup is the oldest trophy for sailing in international sports. The two-time defending champions Team America with lead man James Spithill will have to try harder from the Bermuda Triangle to retain the trophy. 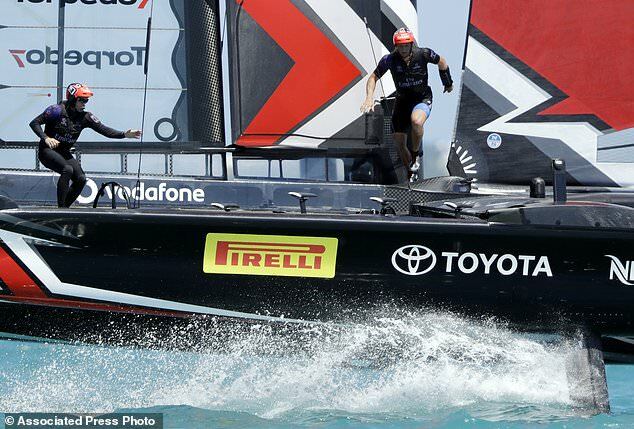 Kiwis, 50-ft catamaran remained undefeated in the showdown with two more victories. The 26- year old Burling has calmly steered the catamaran to the victory in the first four races, though the Oracle team won the qualifiers. The challengers started this year’s America’s Cup with a negative point. Kiwis need four more wins to take the Auld Mug again to Auckland. The cup resided with Royal New Zealand Yacht Squadron in Auckland from 1995 to 2003. Oracle team supported by software tycoon Larry Ellison, one the richest person in the world will need seven most race wins to get the trophy to Ellison. He watched the performance of his team from the team supporting boat on Sunday. Team USA is well funded by Ellison, who has an estimated worth of $55 billion. Team Oracle will have to come up with some brilliant plan next Saturday to counter the tactics of kiwis. Spithill is not happy with the current developments and he understands that there is a need for some serious changes to match the speed of the kiwis. He said that his crew got off the line on Sunday, but the challengers were accelerating in a very impressive way. Now the team will have to work out a plan. He added that the next five days will be more crucial to the campaign. Burling steered the catamaran to victory in 49 seconds and 1 minute 12, seconds in the Great Sound.